Click the products in the layout to shop! 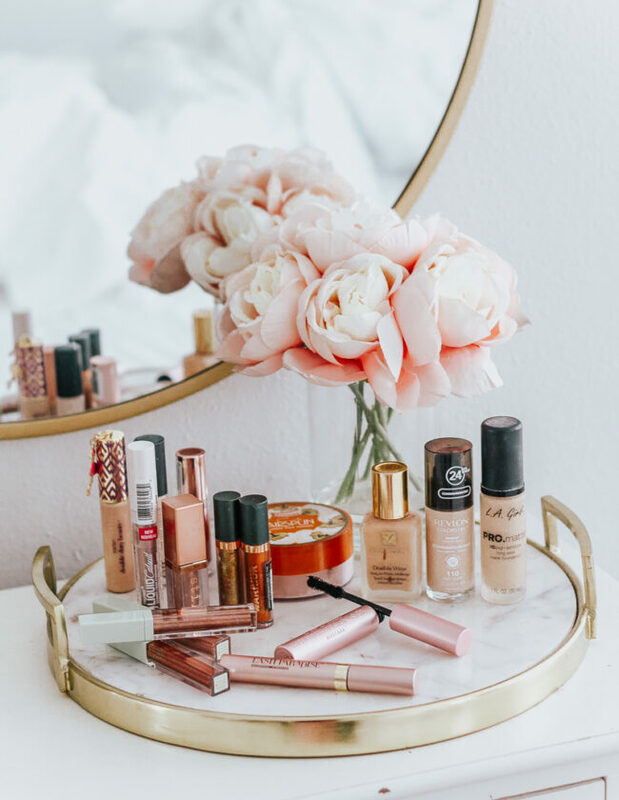 It’s been awhile since I’ve shared my favorite affordable beauty buys, so thought I’d dump out my makeup bag today and share 10 spring beauty buys that I’m loving right now. Oddly enough, it seems they’re mostly Physician’s Formula and L’Oreal products, which was totally unintentional. I suppose I’m brand loyal! I’ve been using these products for a few weeks or months in many cases and have come to depend on these cheapies. (I’ve always loved a good beauty cheapie!) I feel like Mondays should be Makeup Mondays, shouldn’t they? HAHA! Physician’s Formula NudeWear Touch of Blur Concealer ($12.99) This concealer has a subtle coral undertone, which is perfect for covering dark circles. Most people think that you need a light concealer, but really, you need a coral tinged one to cancel out the darkness. When I use it, my eyes look bright and awake and has a surprising amount of coverage. The cushion flow through applicator is nice and the creamy concealer is hydrating, which is great. Bonus points for the adorable packaging. You know I’m a sucker for good packaging. It’s hypoallergenic, paraben free, and cruelty free. I like that Physician’s Formula products are good for your skin. Physician’s Formula Mineral Wear Loose Powder ($13.99) This makes a great finishing powder. It leaves a matte finish but doesn’t have a chalky finish, which is key. Chock full of vitamins and minerals, it’s good for sensitive skin and won’t break you out. It’s also recommended as an effective sunscreen by The Skin Cancer foundation, which is awesome. It also comes with its own little brush, which is super cute. I use shade Translucent Light. Defy & Inspire Nail Polish ($7.49) Target’s private label Defy & Inspire nail polish comes in the dreamiest colors and is free of some of the harsh nasty chemicals that are bad for your nails. (One of my girlfriends is allergic to ALL NAILPOLISHES except for Butter London, Defy & Inspire and Chanel. Poor thing, it can get pricey, so the Defy & Inspire is a great affordable alternative!) I mainly get gel manicures because I can’t paint my nails AT ALL (I wish I had the skills!) but this polish is awesome. L’Oreal Infallible Pro-Glow Foundation ($12.99) I’ve been using this foundation since it launched last year and I AM IN LOVE. It’s the perfect dewy finish foundation. 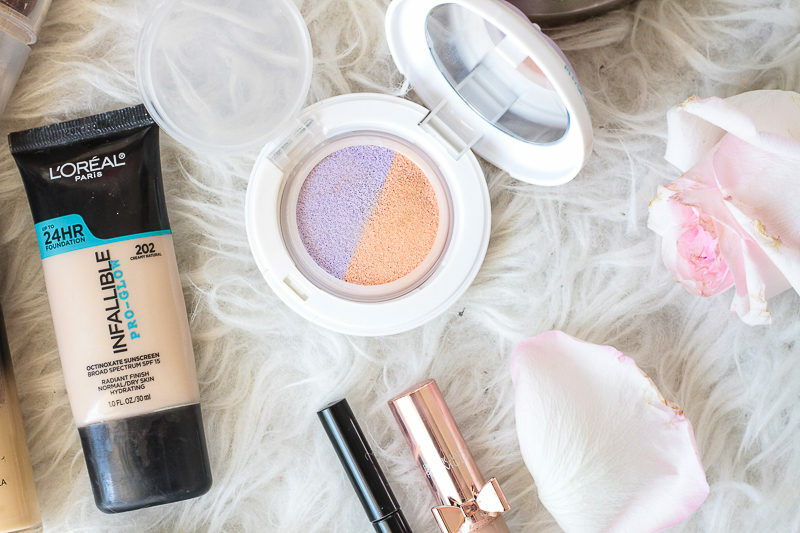 It’s long lasting and offers good coverage, totally rare for a dewy finish foundation. The Pro-Matte finish foundation is pretty good too, but I LOVE the Pro-Glow. I need to try the Total Cover full coverage foundation next!! The shade Creamy Natural is the one that works for me. Batiste Dry Shampoo ($7.99) I had really been struggling to find a dry shampoo I liked… they all either smell weird to me or don’t really do a great job as a dry shampoo. 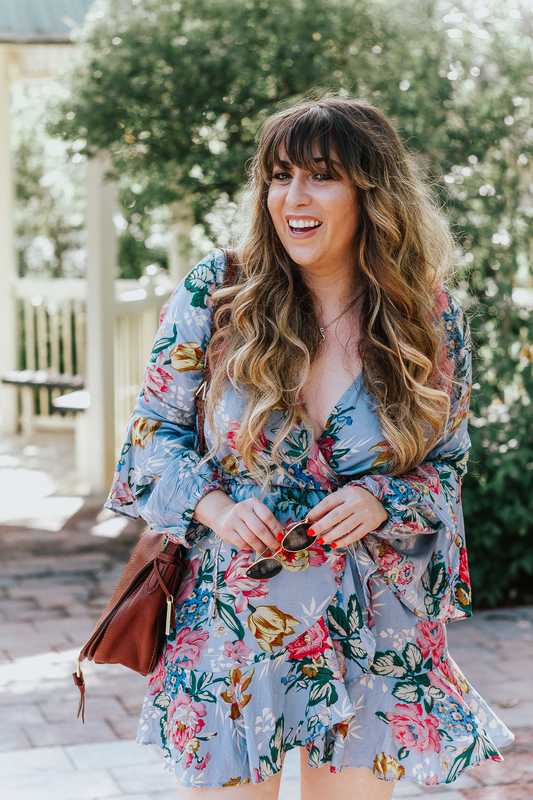 After trying tons of different dry shampoos, the Batiste was a game changer for me! I love the smell and it really does an amazing job of refreshing your locks. The price is pretty sweet too. 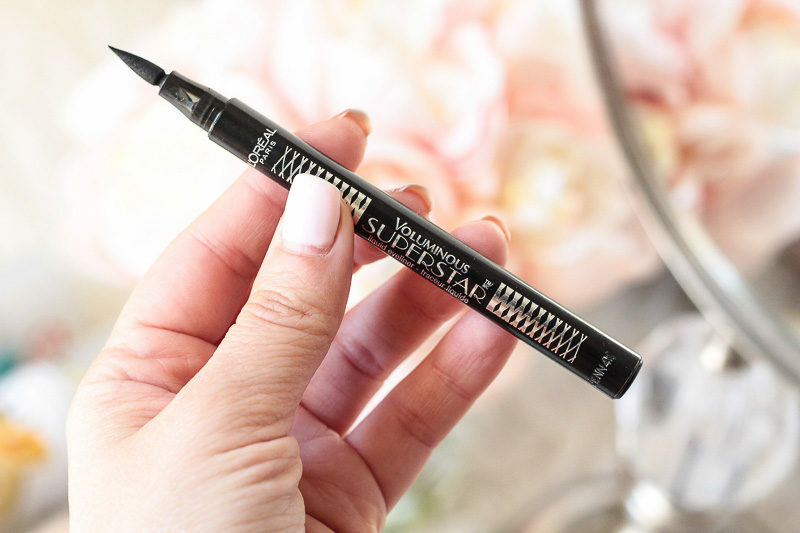 L’Oreal Voluminous Superstar Liquid Eyeliner ($9.99) I’m really, really picky about my liquid eyeliner. We typically stock up on the Benefit They’re Real push up liner, but I didn’t love how it flaked off towards the end of the day. I picked up this liquid eyeliner a few weeks ago when we ran out of liner and I was on a Target run. I’m super impressed! It’s long lasting, doesn’t smudge and has a nice matte finish. (I hate when a liquid liner is, like, shimmery or sort of turns that weird gray color.) For some reason, the description online says that it has a shiny finish, but I haven’t observed that at ALL. So. I don’t know. The pen is easy to use, which is key. I’ll be switching to this liner for now. 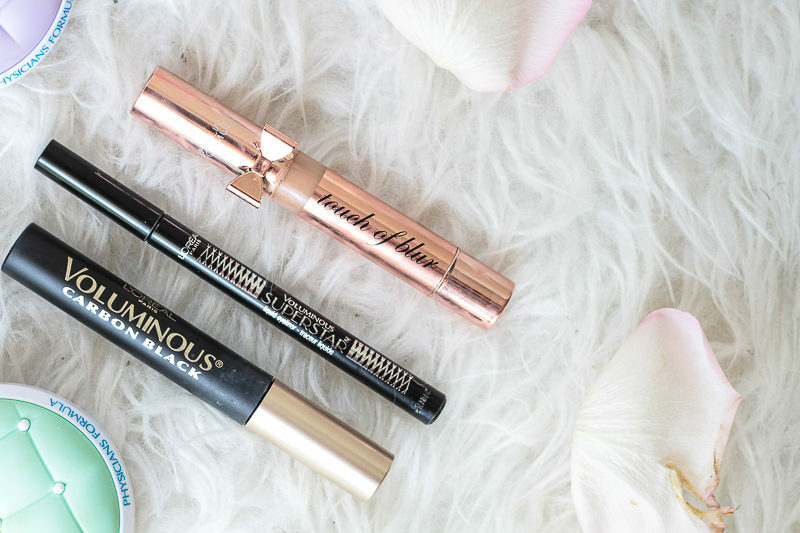 L’Oreal Voluminous Carbon Black Mascara ($7.99) I had tried this ages ago and wasn’t too crazy about it, but I kept reading article after article about how celebs and makeup artists alike swear by the L’Oreal Voluminous Superstar mascara and was like… clearly I’m missing something. I recently read an article talking about the things you should/shouldn’t splurge on and makeup artists all agreed… don’t splurge on mascara. I gave it another shot about a month ago and have been convinced ever since. They basically all recommend this mascara and now that I’ve given it another shot and refined my technique, I’m sold. Physician’s Formula Color Correcting Cushion Compact ($16.99) I’ll be honest, I was initially mainly drawn to the pretty compact and the colors lol. So basically, the lavender/coral corrects sallow skin and darkness, the green/yellow compact minimizes redness and dark spots. I much prefer the lavender/coral compact. I like the idea of the cushion. I think it’s a little harder to use and you do get less product since it’s split, but I really like the result. The lavender really lifts the glow and the coral helps with the dark circles. I don’t really have a lot of redness in my skin, so I don’t use the green/yellow compact as often. Milani Conceal + Perfect Foundation ($8.99) This. THIS THIS THIS. 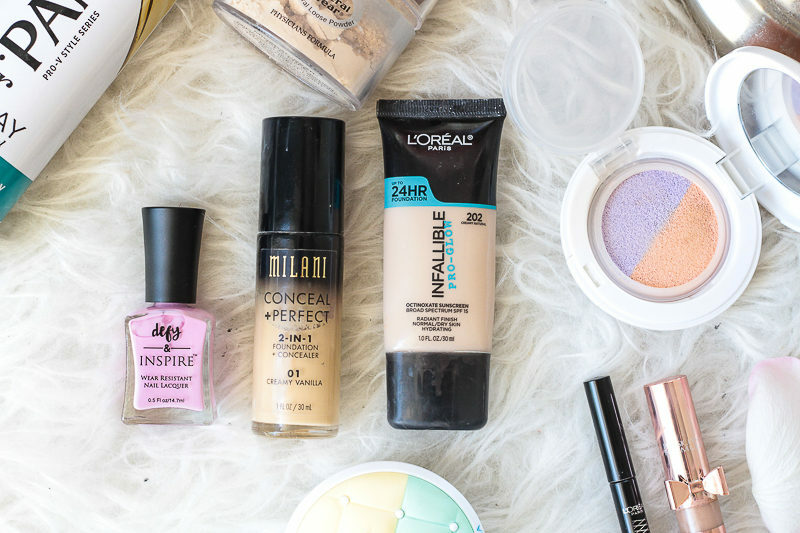 This foundation is truly the holy grail of foundations. I’ve tried all foundations at all price points and this is by far the best foundation I’ve ever used. Flawless coverage, smooth finish, doesn’t feel heavy or greasy. I LOVE THIS. I have a lot of acne scarring and this covers that effortlessly. I’m currently using the lightest shade, Creamy Vanilla. Pantene Air Spray ($4.99) I picked this up on a whim, totally sick of having gross, crunchy hair. It smells great and is super lightweight, but with good hold. 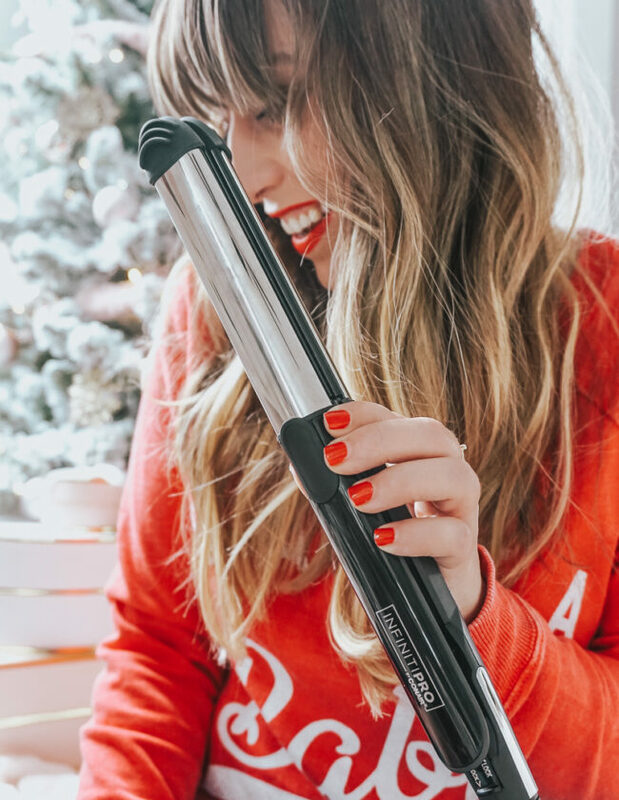 It’s called an “air spray” because it doesn’t have any alcohol which is the thing that dries out your hair and makes it crunchy. Hair is still lightweight and touchable. 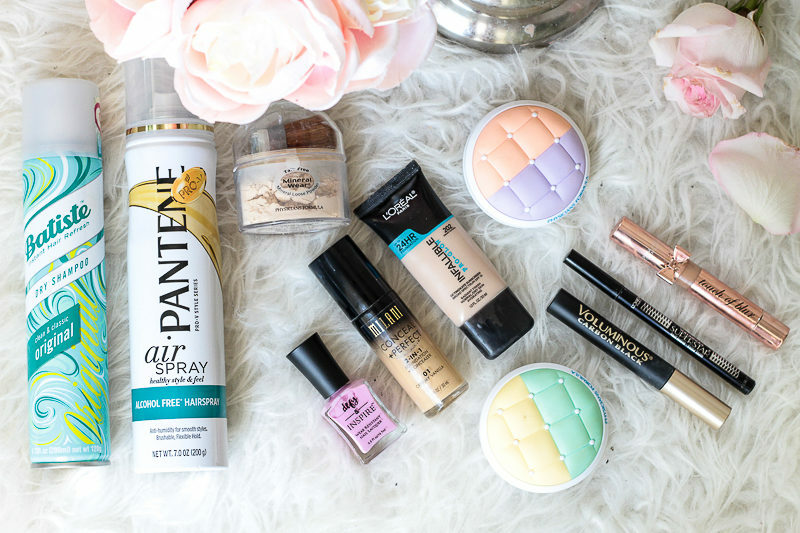 Those are some of my current favorite affordable beauty products. I am forever testing out new goodies, so if you have any recommendations, please, let me know, I’d love to try them! 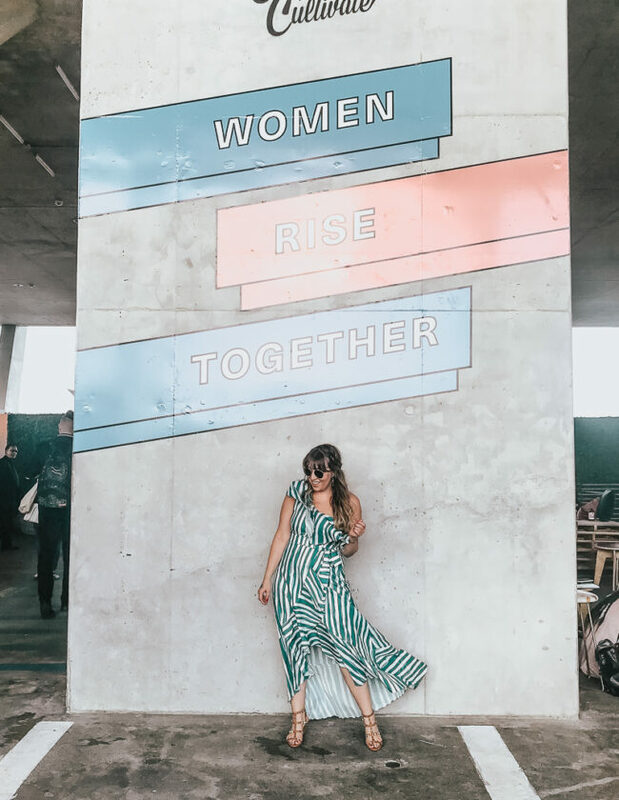 If you’ve tried any of these products, what do you think? Are you into them? Any favorites here? Let me know in the comments!